My toilet is a ticking time bomb. That thing has got to go. I finish blow-drying my hair upside-down and set myself right-side up again. Once I’ve broken eye contact, if I’m really honest about it, I’ll admit it: My old toilet’s probably … perfectly fine. It’s adequate for its purposes; everything works, and, although I have no real way to know for sure, it likely does the job just as well as any other average toilet. In fact, it’s probably a little better than average. My bathroom’s done in yellow tile with one thin, pale blue stripe of tile running around the room at about shoulder height. And there, running around the top of the toilet tank, is an almost perfectly matching, thin, pale blue stripe. I mean, whoever installed the toilet went out of their way to make sure it matched. Nice! I’m someone who appreciates attention to detail, but if it were me, I’m not sure I would have gone to the trouble. If I were a little more generous some mornings, I’d at least give my toilet extra points for style. 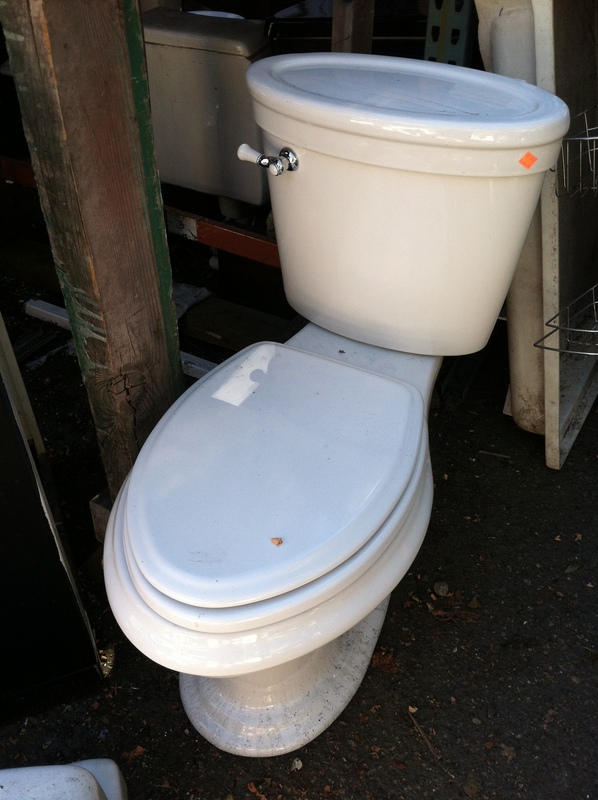 But then, as I was volunteering down at The RE Store the other day, I saw it: my dream toilet. And unlike the last time I saw it glittering under the hot lights of a showroom floor, it’s at a price I’d actually be willing to pay for something I spend so little time with. And as an added bonus, it’s salvaged, which is one of my favorite things. Unfortunately, the very fact of its existence has begun to make me uncharacteristically discontent. As a result, every time I’m alone in the bathroom, looking at that thin, pale blue stripe through a curtain of damp hair as I move the blow-dryer around, I’m just a little … unaccountably … suspicious. The object of Christine’s affection – American Standard Hatbox Toilet at The RE Store: $100. But then, every morning it’s the same thing: I’m upside-down in my bathroom, blow-drying my hair, and I start to notice things about my toilet that no one should ever be close enough to their toilet to notice. There’s a faint stain on one of the bolts holding it to the floor that just might be the beginning of rust. Is that rivulet of moisture running down the side of it the beginning of a leak, or is that just general moisture from the shower? Is that a hairline fracture starting along the base? I squint at it, swirling my hair out of the way with the blow dryer. Uh, no. It’s just a … well, never mind. The point is, I’m trying to not let some fancy toilet sway me from my staunch conviction to not consume needlessly. But some mornings, based on whatever imaginary flaw I’m sure I’ve just spotted on my perfectly innocent toilet, I’m filled with less conviction than others. I’m kind of hoping someone will restore my relationship with my tried-and-true by snatching up my dream toilet at The RE Store, so the next time I’m upside-down in my bathroom, my toilet and I will be on speaking terms again. Come see what might become your object of affection at the stores this week! Special thanks to Christine Clifton-Thornton for authoring this article.